Here is my heart's dance of joy as I prepare for Thanksgiving! 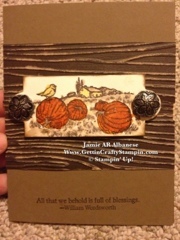 With Soft Suede cardstock as the base to this card. 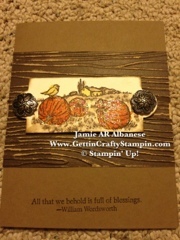 With the Holiday Mini Core'dinations cardstock in Early Espresso run through the Woodgrain embossing folder and my Big Shot. 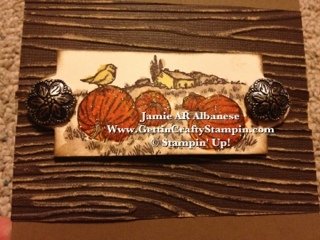 Sanding the top of this embossed cardstock, the lighter color pops thru! 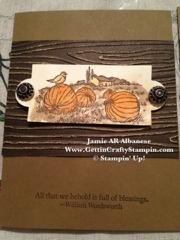 Stamping this pumpkin scene from the Full of Blessings stamp set from the Holiday mini on Very Vanilla with Early Espresso ink. 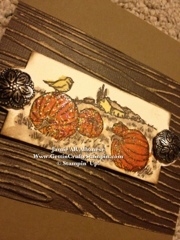 With my Watercolor pen I water colored in the scene with Daffodil Delight, Soft Suede and Pumpkin Pie inks. NOW... I did the pumpkins TWO way!! 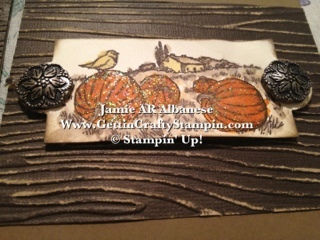 The darker and more glittery pumpkins is using our Dazzling Details glittery glue and one drop of the Pumpkin Pue re-inkers. I then painted in the pumpkins for the darker, glittery pumpkins. I really LOVE this contrast to the neutrals to this glittery look. With our Big Shot and the Apothecary Accents Framelits I punched out this retro accent. It frames the scene sooo well! The Antique Brads tie it all up!! 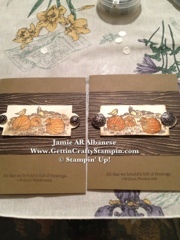 I did the glittery one w/the edges daubed with a Dauber and Soft Suede ink! This scene screams Harvest, Fall and Thanksgiving. 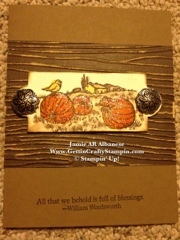 The LNS challenge of Thanksgiving cards is given a nod with this card!! 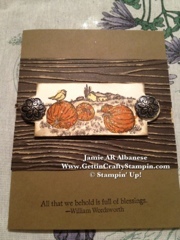 I hope you enjoy this Fall card and take a moment to count YOUR blessings! !